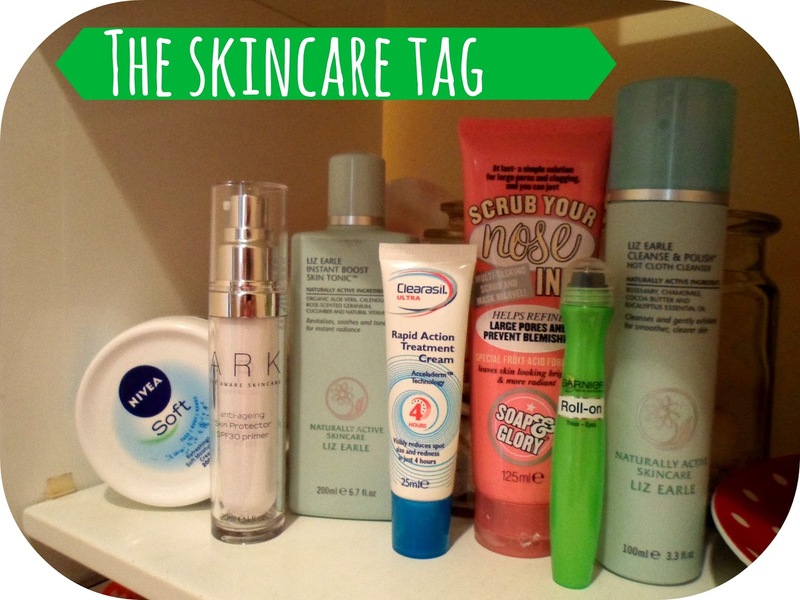 I was recently tagged by the gorgeous Liza from Glambeautys to do this tag! I LOVE Liza's blog and following her on twitter - make sure you go and get check her out - she is literally stunning and her blog is such a good read! 1. Describe your skincare routine in five words. Easy, Simple, Affordable, Refreshing & Light. I've said this in previously posts before but I think my skin is definitely a combination. I never used to get oily skin but over the last few years I tend to get a little oily on my forehead and a few other patches but also have dry spots around my nose. Without a doubt Liz Earle's Cleanse & Polish I have lost count the amount of times I've raved about this on AYellowBrickBlog, it is just perfect for me, gets all my make-up of and always leaves my face feeling fresher than ever every single day! I am (touch wood) extremely lucky with spots and don't really get outbreaks.... saying that I've had a few pop up over the last few weeks but I'm blaming that on the hot weather and me keeping my make-up routine the same during it! BUT in the odd occassion in which I get a hideous friend join my face I swear by Clearasil Ultra's Rapid Action Treatment Cream! Helps to reduce your spot and it's redness in just 4 hours! 5. Face wipes….yay or nay? If you asks me a few years ago I would say yay yay yay but nowadays I would say nay nay nay! 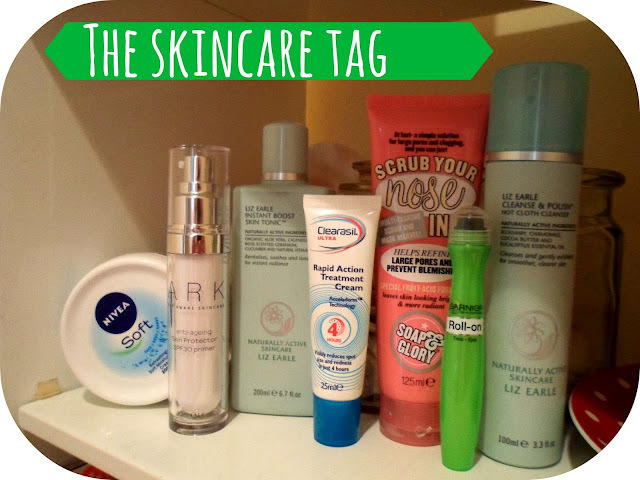 I used these daily all throughout my teens but after using my current skincare products I have realised they weren't actually that great for my face especially for make-up removal! Saying that I do still have some at home for days where I am not wearing any make-up and want to freshen up but I don't include them in my daily routine. Liz Earle's Skin Tonic count? Then Yay! This stuff is amazing after cleansing and makes my skin feeling cleaner and brighter before using a moisturiser! 7. High end skincare or high end make up? I'd pick high-end make-up, just because I am quite lucky with my skin and high-street products work just as well for me as higher end skincare products - so gimme the expensive make-up!!! 8. You’re in a French pharmacy and can only buy one item, what would it be? Bioderma Ceraline H20 - everyone cannot stop raving about this stuff so yes that is what I would pick! I've heard it's a rival for Cleane & Polish so would love to compare and make my own decision! Drink lots of water - I think this is my top tip for alot of things but I honestly think that drinking lots of water has so so many benefits and good effects on the body! Another one would be to NEVER sleep in your make-up, oh and try to have at least one day a week make-up free. I TAG you all to join in with this tag and when you do make sure to let me know and send me a link, would love to read all your answers! Love your answers! I agree that drinking water really does help with your skin. You use so many products I love but my favourite is without a doubt the liz earle cleanser which I actually reviewed today. Been wondering for ages whether I should give the bioderma a go! I hope it's worth it, I'm so tempted! Definitely agree with drinking lots of water, it makes such a difference!